Utilizing x-ray inspection technology on your production line can eliminate costly recalls, public relations nightmares and save on high labor expenses that can cost thousands. With X-ray inspection, there is never a reason to close down your inspection line: the EAGLE systems are fully functional 24 hours a day, 365 days a year. The EAGLE X-ray inspection systems inspect packaged products in the following areas: check-weighing, metal detection, foreign objects, size, shape and can automatically reject defective items from the product line. 2. Once you have quantified these, then consult with us to determine how many of these (or let's say what percentage) complaints x-ray could prevent. 3. Calculate a cost for of these defects. It is well accepted that there are consumer monetary complaint costs, but there are also likely severe market position costs as well. Try to attach a value to each of the complaint categories. The number of complaints per "dead rat" (figurative term only) in a package will be much higher than say a lump of caramel in a cereal box! Do remember, however, that for every complaint that is not a "dead rat" type that the number of complaints that you don't hear about is likely very much higher. That is to say that for every "caramel lump" complaint, you likely have 100 to 1000 times more incidences of this being shipped than you realize. How this system works: A conveyor belt carries your product through a fan shaped beam of X-ray and the detector diodes are rapidly scanned sequentially. This produces a raster image that is sent via interface to the internal computer where software algorithms are applied and decisions made. If the decision is made that the product contains a defect, then an appropriate signal is generated and the reject mechanism is signaled. *No radioactive substance is ever present. 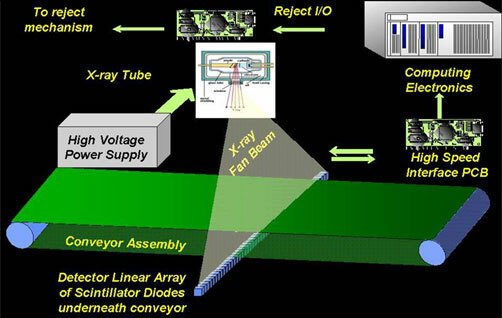 The following is an example of the X-ray inspection process and is analyzed by the SimulTask imaging software. The gray scale image produced is a video representation of the spatial density information acquired by the computer. This line-by-line information is laid side by side to build a raster image (much like a television image) and is displayed in shades of gray. The picture is made up of the energy information from each of the diodes in a scan, and this data is retained in a very large buffer that holds the information from many successive scans (enough to fully cover the product being inspected). The photo to the right will help in understanding this principle. In this process, the product (prepared meal) is X-rayed and the density values are displayed on the monitor as a gray scale image (center image). This image can then be converted to a three-dimensional density plot giving shape and volume to the image. The magnitude of the vertical dimension is proportional to the "grayness" of the respective portions of the image, and thus is representative of the area density at any given point on the product. SimulTask Image Anakysis: Carefully examine the image to the right. Using this image, the computer makes a number of decisions, some of which use direct logic (reject if a contaminant is detected), and some of which use reverse logic (reject if count is incorrect or improper weight). The metal detector cannot detect nonmetallic particulates, and furthermore is unable to effectively monitor due to the metal-foil covering on the meal. The check weigher cannot reliably detect (for example) the absence of one bun because the package weight varies more than that due to the variability of the weight of the pickles. The red operator rejects if it finds a particulate contaminant, in this case, stainless steel. The green operator rejects if the item is under weight and identifies which compartment or location has the weight variance.